The period between the end of hunting season and spring, marked by the opening of the golf courses and the start of trout season, is a long and dreary one. This can be particularly painful for those of us who have knees no longer suited for skiing and who have no taste for professional basketball or hockey. 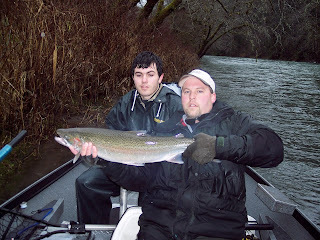 Here in the Pacific Northwest this wet and dismal season is alleviated by the arrival in our many rivers and streams of the steelhead trout (Oncorhynchus mykiss), the official Washington State fish. The steelhead, like its cousins the salmon, is an anadromous species, meaning it spends its adult life in the ocean before returning to its native stream to spawn. Unlike the salmon, the steelhead does not necessarily die in the effort, but if successful in negotiating the predations of fishermen, tribal nets and sea lions, may return again and again. 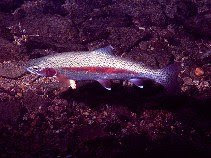 As a result these fish, which are essentially seagoing rainbow trout, can reach 25 or 30 pounds. In the fast and heavy waters they prefer, they offer fishermen an extreme challenge. They have become for many an addiction. The most effective method of fishing for these magnificent critters requires the use of a double-ended riverboat, preferably with an experienced guide on the oars. Negotiating the many rapids on the free flowing rivers of the Olympic Peninsula can be a dangerous and possibly fatal experience for a novice. I have often said that the 15 or 20-mile trip down one of these wild rivers is worth the price of admission. 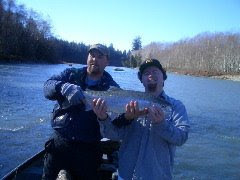 That theory may soon be put to the test as year after year fewer and fewer wild steelhead return to their home rivers. Of course, we’re catching fewer fish but equally as important, we see almost no redds, the nests on the shallow gravel bars where the mating fish have spawned. In years past when we drifted quietly across the shallow gravel flats we could see hundreds of these. Now we seem surprised when we see one or two. In two trips of two days of fishing this year my fishing partner and I managed to land only two fish, a mere fraction of what we would see in years past. In the face of my own admittedly anecdotal experience I decided to see if I could figure out what was going on. 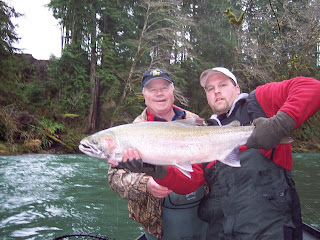 I could not understand why the State of Washington would allow fishermen to continue to kill and keep fish and permit the tribes to place nets in the rivers to intercept wild steelhead when the population appeared to be crashing. Bless the Internet. I located some websites and got the email addresses of a couple of guys in the Department of Fish and Wildlife. They were cooperative in directing me to other sites where I could view the reams of data, court decisions and position papers on steelhead. Wading through all this stuff led me to the unhappy conclusion that my worst suspicions were correct. 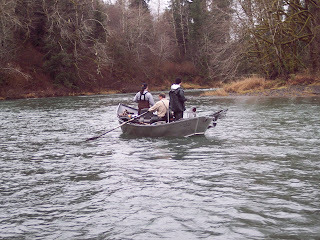 Catch records from the sports and tribal figures confirmed that the number of returning steelhead had declined precipitously. Unfortunately, and perhaps intentionally, data for the most recent two years was missing. If my own experience, and that of my guide who fishes these rivers 50 times per year is any indication, the last two years would show further declines to dangerous levels. It just happened that while I was muttering about the plight of the steelhead, I was reading a book called The Unnatural History of the Sea by Callum Roberts, a fisheries biologist from England. In it he describes how we have been systematically destroying fish populations since medieval times. The pace has intensified as technology improved and the world’s population grew. The greatest villain has been the trawl, a heavy net dragged across the bottom that sweeps everything in its path. It captures not only the species sought, but also any other fish in its way, including juveniles and, in the process, destroys the coral, reefs and very seabed. It not only wipes out all the fish… it ruins the habitat necessary for reproduction. As late as 1955 with the publishing of The Inexhaustible Sea man had still not learned the lessons of history. Over exploitation had already eliminated whales, fur seals and sea turtles. European waters had been cleaned of Atlantic salmon, herring and eels and countries competed by building bigger ships and larger fleets. They ranged further from their own shores to exploit new fishing grounds and different species. In North American waters the collapse of the cod, grouper and flounder, just to mention a few have occurred in recent history. Long line fishing for swordfish has decimated that species as well as threatening sharks caught by accident. Things in the Pacific Northwest were no different. In his excellent book, Salmon Without Rivers, Jim Lichatowich describes the history of the decimation of the Pacific salmon through destruction of habit (logging, mining and dam building) and over fishing. Unwise hatchery programs contributed to the collapse. The rivers of the Olympic Peninsula are unique. Flowing free and clean out of the Olympic Mountains and unobstructed by dams, they are perfect for supporting the wild populations of steelhead that have existed there for thousands of years. Yet the Washington DNR cannot bring itself to take the necessary steps to prevent the elimination of this wonderful fish from their native rivers. In numerous email exchanges with DNR officials I have yet to get a clear answer. A lot of bureaucratic dancing around the issue leaves me frustrated. Their own data shows the sports fishermen are killing too many fish. (Many fishermen like myself have voluntarily gone to catch and release in the last several years). The biggest problem is the tribal nets in the rivers. The Indians are legally entitled to 50% of the catch. However, they have routinely taken 3 to 5 times as many fish as the sports fishers, and those are only the numbers they report. In talking to guides and lower level fisheries people in the area, it is clear that the tribal numbers are under reported. Worse, when illegal netting is reported the DNR does nothing. 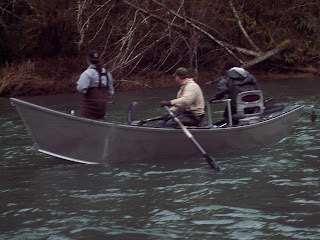 I guess it’s politically incorrect to clamp down on the Indians as they systematically net every returning steelhead. I guess we would not want to challenge the myth of the Noble Savage in harmony with his environment. They do, after all, sell these fish, not eat them. Turns out, they are just as greedy as the White Man. I think what happened in the oceans and is happening with the Pacific steelhead is best described by a Garrett Harden essay entitled “The Tragedy of the Commons”. In it, Harden supposes a common grazing plot shared by many farmers. In his own self-interest each individual farmer is motivated to add a cow to his herd. The burden of this added animal is shared by all. Eventually, when enough farmers have increased their herd, the common grazing plot is destroyed. Sounds familiar, doesn’t it? The DNR has the authority to shut down tribal netting if the species is in trouble and they clearly could restrict the sports fishers to catch and release or shut it down all together. Unfortunately, I doubt they have the balls to do it. **All fish photographed in this article were returned to the rivers (alive) to continue their journies. That is admirable that you released the fish shown, but even if you had taken them home to eat personally that would not have bothered me. Likewise, I have no problems with Indians who catch fish for their own consumption, even if they are granted longer fishing seasons than the rest of us. I do take issue when fishing rights are abused and the fish is either sold or worse yet, not even eaten. My parents live near the Shoalwater Bay Indian reservation and there were times when truckloads of fish would just rot because far too many had been caught than could be used. One of the restaurants I worked for during Jr.High and High School used to get really great deals on blackmarket salmon from the reservation. The decision by Judge Boldt to award 50% of the harvest to Indians in 1974 had a huge impact on non-Indian fisherman in that area. So much so that Judge Boldt became greatly despised and hated. My late father-in-law worked at the V.A. Hospital at American Lake in Tillicum. One of the patients he had in his care while there was the same Mr. Boldt. Because of death threats he was registered under an alias and my FIL wasn't allowed to discuss his presence there until after his (Boldt's) death.